On the drive to Capitol Reef we took the Scenic Byway 12, which is 122 mile route between Capitol Reef and Bryce Canyon National Parks. It holds the distinction of the All American Road. 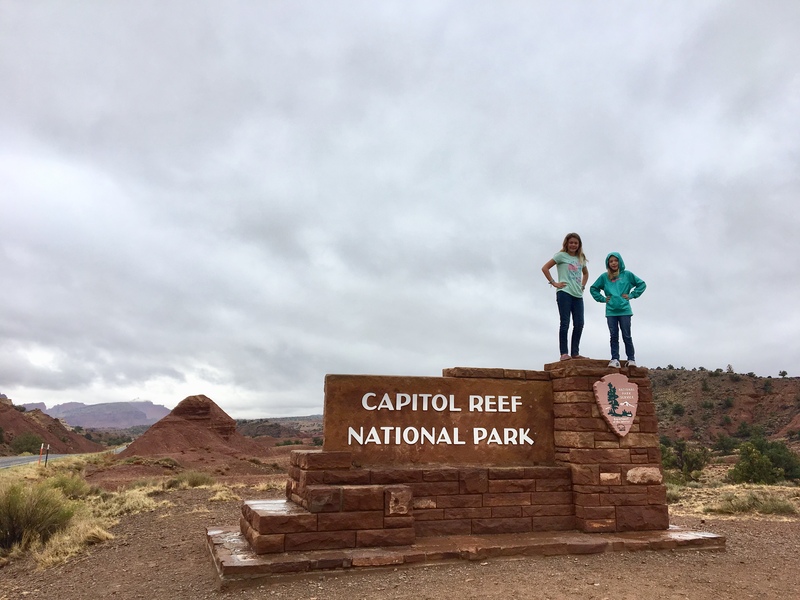 Here is the recap video of our trip to Capitol Reef National Park . We arrived around lunch time and it was raining so we ate in the car before heading into the visitors center to explore. The girls worked on the Junior Ranger books in the prairie dog home exhibit and would pop up and scare people… it was hilarious. These books took them a solid hour in the center and then another hour in the car as we were driving around. Some Junior Ranger booklets can take around 5 hours so we were happy to be able to finish it before we drove out of the park. On the days we can’t finish before we leave the park, we mail it in and they mail the badges to us. Located in south-central Utah, in the heart of red rock country, Capitol Reef National Park is a hidden treasure filled with cliffs, canyons, domes and bridges. It is in the Waterpocket Fold, a geologic monocline (a wrinkle on the earth) extending almost 100 miles. This park is like The Grand Canyon and Zion with it’s cliffs, canyons, domes and arches but without the crowds. However, it has a very unique feature- orchards! It’s the only national park in the country to have a orchards. They have apple, peach, cherry, pear and apricot orchards. We were lucky enough to be here during the harvest of the apples. We were able to pick and eat as many apples as we wanted for free while in the park. If you want to take any with you, it’s only $1 per pound, cash on the honor system. We picked 2 pounds to bring home. Early pioneers planted the orchards as a cash crop and for subsistence when they settled here in 1880. No more than 10 families lived here at one time and the last family left in 1969 when the National Park Service took over managing the 3,100 trees in the orchards, with historic cultural irrigation practices, pruning, mowing, pest management, planting, mapping, and grafting. It was built in 1896 to teach the children of the 8 families that lived in Fruita. The families were large though so with 8 families, there were 22 students for the first class held in the building. The first teacher was 18 years old but had been teaching for 6 years in her home until the building was built. It maintained a school until 1941. It had also been used as a church and town hall meeting location. At 3:00pm we attended a ranger led program about the petroglyphs. Fremont and ancestral Puebloan people left petroglyphs throughout the park depicting their stories from the 300-1300 era. One of the better known sites of Capitol Reef, this natural bridge sits over 300 feet above the Fremont River. The hike is 2 miles long. It is a must do if visiting the park. This was a fun surprise on the hike.. it’s called Miniature bridge. We loved all the climbing opportunities. This is the snake Mackenzie wants to bring home- seriously we react the same about snakes as we do puppies. After our hike, we rewarded ourselves with fresh baked pies. If you visit this park, this is a must stop! They use the fruit harvested here to bake these pies.